Nine Inch Nails’ Trent Reznor has made his soundtrack for Leonardo DiCaprio’s climate change documentary Before The Flood publicly available. The quiet, electronic score—produced with Atticus Ross, Academy Award winner Gustavo Santaolalla, and Scottish post-rockers Mogwai—is Reznor’s fourth film soundtrack, and his first for a director other than David Fincher. Given that this is a) new Trent Reznor music, and b) for a movie about the possible total environmental collapse of the world, the music on Before The Flood is remarkably upbeat. Not chipper, exactly, but more cheerful than “Stranded polar bears on a melting ice floe.” You can listen to samples below, or stream the whole thing on Apple Music. Before The Flood was directed by actor-director Fisher Stevens, who also produced the 2009 Oscar-winning enviro-doc The Cove. 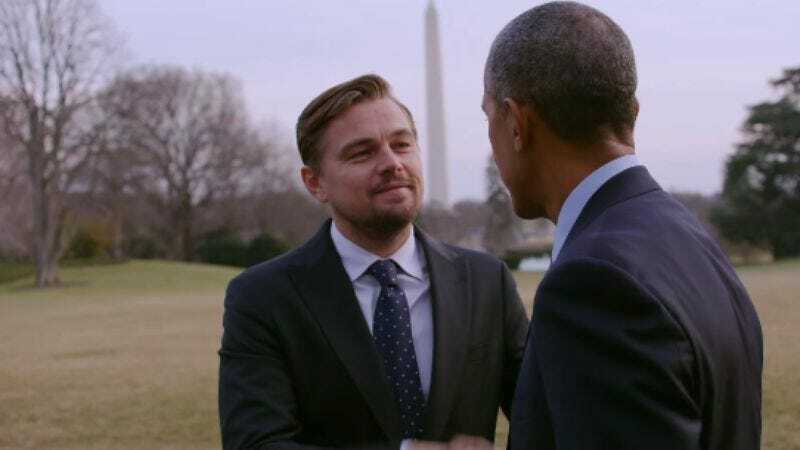 The film tracks DiCaprio—who recently faced criticism for his alleged links to a corruption scandal in Malaysia—as he journeys around the world, looking for solutions to climate change. (Presumably, his upcoming Captain Planet will feature a similar plot, albeit with more cartoon monkeys.) The film arrives in New York and L.A. theaters on October 21, before appearing on the National Geographic Channel on October 30.